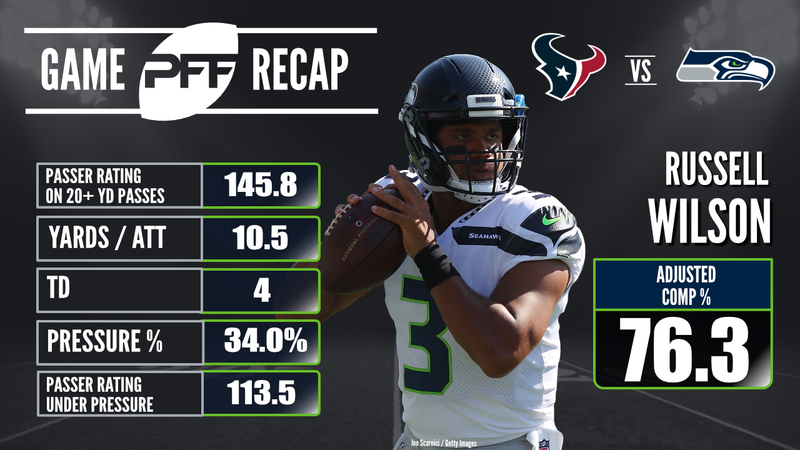 Sunday had it all in the NFL, including an incredible game between the Seattle Seahawks and Houston Texans where both offenses simply could not stop scoring. Despite some terrible conditions around the league, we still saw plenty of impressive performances on the offensive side of the ball, so with that in mind, here are the Sunday Standouts on offense in Week 8. It should be noted that Travis Benjamin’s grade yesterday is for his offensive performance only, with his special teams mistake costing the Los Angeles Chargers two points. On offense he caught all four catchable passes thrown his way, giving him a perfect drop rate on the day. He had a touchdown brought back thanks to an offensive pass interference penalty, and forced three missed tackles on one of his receptions, helping boost his grade. The Cleveland Browns gave a plucky performance against the Vikings in London, and right tackle Shon Coleman played his part in that. Playing 40 snaps as a pass blocker, Coleman didn’t allow a single sack, hit or hurry, good for a perfect pass blocking efficiency rating of 100.0. Jack Doyle was the Indianapolis Colts top target yesterday, with 13 passes thrown his way. He finished the game with 121 receiving yards, and with those yards coming on 40 snaps as a receiver, he produced an impressive 3.03 yards per route run average. In his first start of the season, Chargers rookie guard Dan Feeney proved why we liked the selection of him in the NFL draft so much. He excelled as a run blocker, and didn’t allow a single sack, hit or hurry in 30 snaps in pass protection, good for a 100.0 pass blocking efficiency rating. Travis Frederick produced a 97.0 pass blocking efficiency rating, with one hurry allowed on 25 pass blocking snaps, but it was as a run blocker where he really stood out. With several key blocks in the Dallas Cowboys win over the San Francisco 49ers, he finished the game with a 92.3 run blocking grade, second best among centers in Week 8 so far. 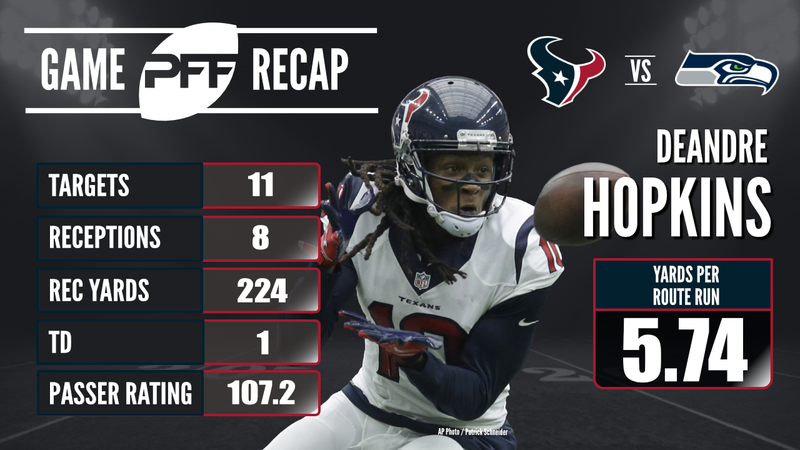 The Houston Texans top target DeAndre Hopkins delivered on Sunday, picking up 224 yards as a receiver against the Seahawks. Coming on 39 passing snaps, he produced an eye-popping, 5.74 yards per route run average, second behind only JuJu Smith-Schuster this week. Another interior offensive lineman who impressed was Philadelphia Eagles center Jason Kelce. Like Frederick, he wasn’t perfect in pass protection but did still produced a solid pass blocking efficiency rating of 95.1. His run blocking grade of 93.8 was the best of any center in the NFL so far this week, continuing on his impressive 2017 season. After a sluggish start against the Browns, the Minnesota Vikings pulled away late in the game, with running back Jerick McKinnon key to their offense both as a runner and a receiver. Seeing 20 combined touches, he forced five missed tackles as a runner, and another as a receiver, he produced a 100.7 elusive rating in the game. The NFL’s newest social media star, Pittsburgh Steelers wide receiver JuJu Smith-Schuster capped off a week where he made headlines for getting his stolen bike back, with the best game of his young NFL career. Targeted 10 times in the game, he pulled in seven receptions for 193 yards, good for an NFL passer rating of 145.8. Time and time again it looked like the Texans were going to pull off the upset against the Seattle Seahawks, but quarterback Russell Wilson kept bringing them back. Excelling throwing the ball downfield, he produced a passer rating of 153.3 on throws 20+ yards downfield.